You have the option of selecting which columns of data make up the display in the many race views and the Form View, and you can also specify the order in which the columns appear. The image above shows two different examples of user-selected columns in the Field View, which has over 115 available data columns to choose from. 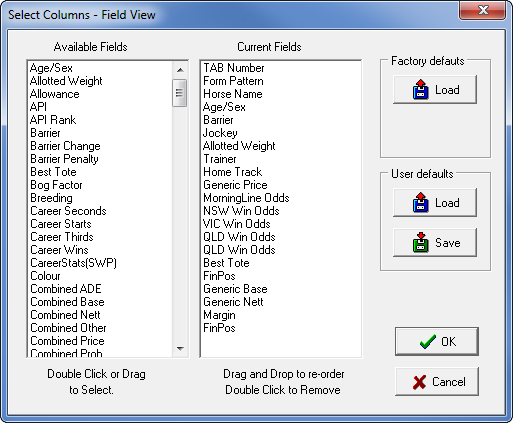 To add or remove columns, or to reorganise the order of display, right-click anywhere in the main body of the window (except the Horse column – this is reserved for the Edit Black Book function, and any of the other user-editable fields such as Form Comments, Horse Profile, User Horse Comments), and from the menu that pops up, click on Select Columns. The Select Columns box will appear, showing two lists of columns, the Available Fields and the Current Fields. Available Fields is the complete list of columns from which you can pick those that you want to be displayed in the view that you are customising. The list of Available Fields is relative to the view that you right-clicked to open the Select Columns box. For example if you open Select Columns from the Form View, the Available Fields list will contain only those fields/columns that can be used on the Form View. Current Fields lists all the columns that are currently displayed in the view you are customising, in the order that they are displayed. The top of the Current Fields list equates to the left column in the current View. Please note that it is not possible to remove or move the TAB Number column which always remains at the top of the Current Fields list, or the left-most column. To add a column to the Current Fields list, simply drag the chosen column name from the Available Fields list to the desired position in the Current Fields. Another method to add a column is to double-click the chosen column in the Available Columns list. This action will add that column to the bottom of the Current Columns list, from where you can drag it to the desired position. To move a column to a different position in the Current Fields list, click on the name of the column and, holding the mouse button down, drag the name to the desired position in the list, and release the mouse button. To remove a column from the display, double click on its name in Current Fields. To check how your reorganised columns will look, click on the OK button. To make more changes, again right-click in the body of the window and click Select Columns. Once you have arranged the display to your liking, you can save the configuration by opening the Select Columns box again and clicking on the Save button under User Defaults. This will allow you, at some later stage – perhaps after trying a new setup or after temporarily using a different display for a particular purpose – to recall your saved User Defaults, by clicking on the Load button. Depending on your subscription package there is maximum of eleven race views, shown in the image below, and the Form View, which is accessed by clicking on a horse's name in the Field View. These same Select Columns guidelines apply to all the views, although the Available Fields list will contain only columns relative to to the view being customised. The User-1, User-2, and User-3 Views could be described as extra Field Views. You will have at least one of these, and depending on the data package that you subscribe to, you could have two or three. When you right-click in any of the User Views or the Field View you will notice that apart from Select Columns and Set Font, the pop up menu also contains Copy Column Layout from.. Selecting this action enables you to copy the entire column layout from one view to another, allowing you to use the layout as a basis for additional changes. To change the display font, right-click anywhere in the main body of the window apart from on a horse's name, Form Comments, Horse Profile, User Horse Comments and from the menu that pops up, click on Set Font. 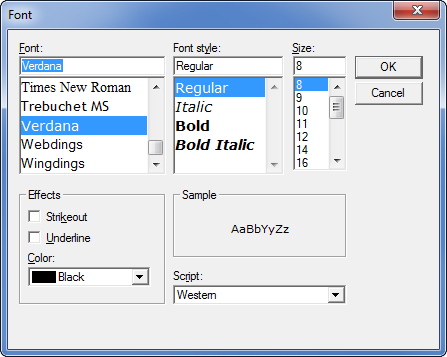 In the Font box, select the Font, Font Style, Size and Color from the Font menu, then click OK. The default font is Microsoft Sans Serif, Regular, 8, Black. The image below shows the font about to be changed to Verdana.